Silver Volkswagen Touareg, manufactured in 2012, first registered on 1 December 2012. Cylinder capacity: 2967cc, CO2 emissions: 189 g/km. As of 15 December 2017 this vehicle had done 31,789 miles. Current estimated odometer reading: 39,800 miles. I hope he crashes into a train. Just take your foot off the accelerator pedal and just slow down. Dont use your brakes just slowly slow down. 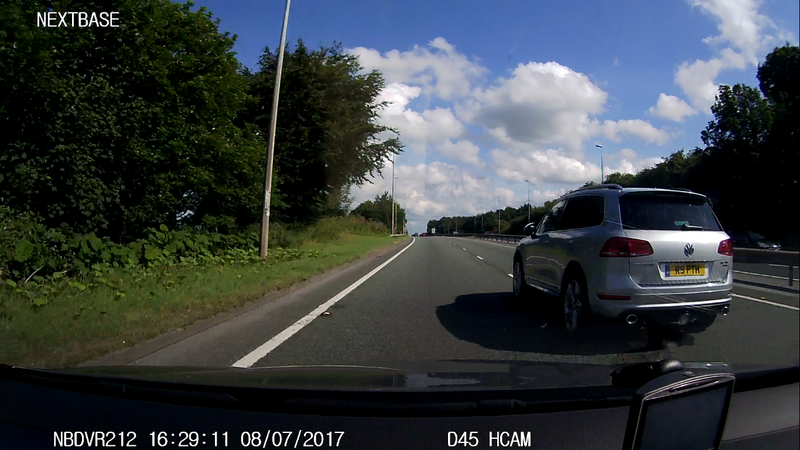 Hopefully the car in the nearside lane will do the same. I hate tossers like this idiot! what was the drivers gesture of choice? Driving along the A55 towards Chester, I'm overtaking slower vehicles whilst observing the 70mph speed limit and this idiot appears behind me about 2 foot off my bumper and gesturing me.I pull back into the nearside lane after my overtake, he then speeds past, beeps his horn at me and calls me a wanker and disappears off at around 80/85 mph...and I'm a wanker? Let the prick crash. Maybe it'll teach them a life lesson..about not being a prick!